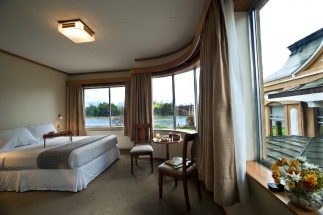 Hotel Naguilán is located in an elegant german style building, 900 meters from the Square of the Republic of Valdivia, in General Lagos street; keeping the heritage of German architecture. It is located 32 kilometers from Pichoy Airport. 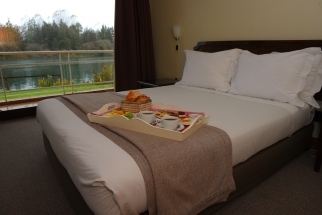 The hotel offers rooms overlooking the Canal Haverbeck, equipped with plasma TV, free Wi-Fi, breakfast and a welcome drink, also has a large garden with pool and terrace overlooking the Valdivia river. Guests can relax on the terrace or in the lobby of the Hotel overlooking the river, swim in the pool, try our cuisine at the Esencia restaurant or enjoy reading a book in the lounge. 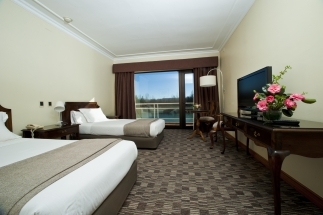 We have 36 rooms, which are equipped with everything that is needed to make you feel at home.